Why is it that programs assume that they know best for you and don’t honor your requests?? When I installed Adobe CS2 (great software BTW), I also got Acrobat 7.0 installed. I’m not all that thrilled about the PDF in general but they do make reading a big document a little easier. And they are the de facto standard when it comes to whitepapers, something I read a TON of, so I’ve learned to live with them. What I can’t live with is the fact that they add all kinds of garbage to all my applications. The toolbars in Word are nasty enough with Adobe throwing a bunch of extra crap in there that I’ll never use. I don’t need a top-level menu item to generate or comment on a PDF. To make matters worse, when I hide the toolbar it simply reappears (seems to happen when the window loses focus and then regains it). GAAHH!! I googled around for a solution but nothing was forthcoming so I attempted to edit my “normal.dot”. Nothing. Enter the registry hack. If you work in the IT industry and even remotely like British humor, you HAVE to watch this show, “The IT Crowd”. Since Channel 4 isn’t so nice to anyone who’s outside of the UK (for bandwidth reasons, I’m sure), you’ll have to watch via some other links – try looking in the comments if the direct links don’t work for you or you don’t use BitTorrent. 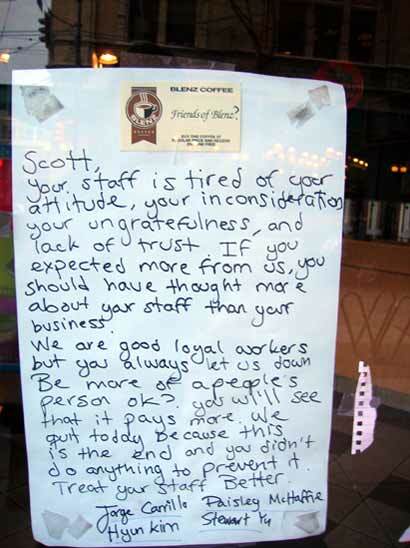 I guess the employees of this Blenz Cafe in Vancouver had put up with their boss long enough. The four co-signors decided to up and leave at once and post a little note to everyone about the action. Beyond Robson is the one that rode past and posted it. Having personally worked for some real losers, I gotta hand it to these folks for standing up to a boss that sounds like he deserved it. You are currently browsing the Driven to Develop blog archives for February, 2006.